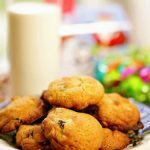 Soft and chewy white chocolate macadamia nuts cookies recipe! Stuffed with white chocolate chips, crunchy macadamia nuts and full of sweet rich California Figs. These are the most decadent cookies and so delicious! Combine the dry ingredients - flour, salt and baking soda - set aside. Cream together butter, sugars, egg and vanilla. Add the dry ingredients and combine well. Stopping to scrape the edges of the bowl to make sure all of the flour is combined. Using two spoons, drop the cookie dough onto a lightly greased sheet pan. Bake in a preheated oven 10-11 minutes until just barely golden brown. Remove from the oven and transfer to a cooling rack to finish cooling completely.